Yet another retro element to love. Terrariums! I just made my first one over the weekend. It turned out great and I am anxious to do another one for a lower-light area. These groovy planting containers are a wonderful way to bring the outside in and I am finding out they work very well with little light. So they are perfect for a below ground basement room. They add a freshness and a tropical feel to any setting. There are some things to consider when planning your terrarium. The container must be glass or another clear substance through which light can pass. I definitely prefer glass. Your terrarium should have a large enough opening to allow for the emplacement of soil and plants. There are however tools you can buy or make to plant small plants from a very narrow opening. Consider taking a small piece of bamboo, purchased at a nursery, and sticking the stem of a spoon or fork in the bamboo and taping it securely. Voila! A terrarium shovel and rake. Cool! The plants selected for a terrarium must have similar environmental needs. You can’t plant a cactus with a tropical. Needs are different. All plants in a terrarium should have similar light, moisture and other environmental needs. If you want to grow sun-loving plants in natural light, use an open terrarium. If you want to grow plants that require high humidity, the container should be closed. The terrarium must be thoroughly cleaned before use (to prevent bacteria growth). Open: can tolerate some direct sunlight. However, too much sun may burn leaves that are in direct container with the sides of the container. Closed: A closed terrarium can also be an open terrarium to which a cover has been added. Closed terrariums should be placed where they will receive bright light, but no direct sunlight. If placed in direct sunlight, the temperature inside the container rises considerably and literally cooks the plants. STEP 1: Drainage: A terrarium does not have drainage holes. Therefore, you must supply a drainage layer to prevent damage to plant roots. Crushed river gravel works well and is pretty. You want to use 1 to 4 inches of drainage material depending on the height of the container. Generally the depth of the drainage material, charcoal, and soil should equal about one-third the height of the container. STEP 2: Charcoal: On top of the drainage layer, place a thin layer of charcoal. This will help keep the soil fresh and not develop a musty, smelly odor. STEP 4: Landscaping and Planting: Remember, plants grow. It is advisable to choose slow-growing plants and not to overplant. Do not feed plants in a terrarium ~ you don’t want them to get big remember? Heat: Closed glass containers trap and hold heat, and excessive heat is perhaps the main cause of death in terrariums. It is important that terrariums not be placed in direct sunlight. 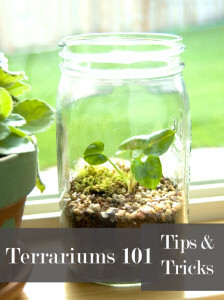 Lights: A newly planted terrarium should be placed in shade for about a week. Then adjust light according to the requirements of the plants. Most terrariums do better in diffused or filtered light than direct sunlight. Artificial light can also be used. Too much sun: Leaves wilt and develop burned spots. Move the terrarium to a shadier spot. Too little light: Plants develop tall, thin stems that are weak and unable to hold up leaves. Leaves are pale and fragile. Increase amount of light slowly. Open terrarium: Test soil before watering. For plants that like moist soil, the top earth should feel barely moist before you add water. For cacti and succulents, touch below the surface layer. Lower soil should be only slightly damp. Closed terrarium: These should rarely if ever need water. My kind of plant care! Too dry: Leaves wilt and look pale. Moss becomes brown or faded. Add a little water and mist leaves. Too much water: Excessive water encourages the growth of molds and causes plant decay. If terrarium walls have more than 25% condensation, remove the cover until walls clear. You may have to do this more than once. In a closed terrarium, there should be only occasional clouding. Hi im Emma and im 12 years old and i really like your website i think it has some really good tips in it. I just made a terrairem and it looks really really cool i really <3 it.